Web inventor Sir Tim Berners-Lee has received a grant to create a technology that will give users more information about the origins and sources of digital content. Berners-Lee received a Knight News Challenge award Wednesday, during the Interactive Media Conference and Tradeshow 2008 in Las Vegas. Sixteen ideas to fund innovative digital projects around the world were awarded $5.5 million dollars from the John S. and James L. Knight Foundation. This is the second year of the $25 million Knight News Challenge, which funds digital information innovations that transform community life. Announced at the Interactive Media Conference in Las Vegas, this year's projects will touch people in rural India, the townships of South Africa and on college campuses across the United States, among other places. Berners-Lee's project is a partnership between the Media Standards Trust and the UK-based Web Science Research Initiative, of which he is a director. 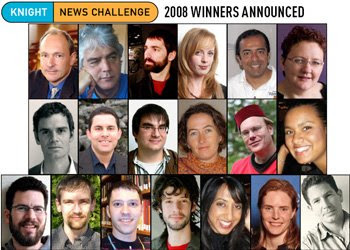 According to the 2008 Winners Reference: With the copious amounts of information (and misinformation) on the Internet, the public needs more help finding fair, accurate and contextual news. The plan: to design a way for content creators to add information on their sources to their reports, as a form of source tagging. For instance, a reporter could note that an article was based on personal observations, interviews with eyewitnesses or specific, original documents. Filters would then use this data ('the story behind the story') to help find high-quality articles. A reader searching the phrase 'Pakistan riots' for example, might find 9,000 articles. But filtering by 'eyewitness accounts' would yield a more selective list. Berners-Lee, Moore and the Web Science Research Initiative are working with the BBC and Reuters on how to best integrate the tagging into journalists' normal workflow.